Though most out-of-towners find it laughable that we consider Arizona a bit cold during the winter time, I know I crave some soup this time of the year to warm me up. Thankfully, “The New Book of Soups” by The Culinary Institute of America just hit stands in December and provided some tasty recipes to keep our taste buds and temperatures happy during the chilly months. Place the chicken and water in a large pot. The water should cover the chicken by at least two inches; add more if necessary. Bring the water slowly to a boil over medium heat. As the water comes to a boil, skim away any foam that rises to the surface. Adjust the heat once a boil is reached so that a slow, lazy simmer is established. Cover partially and simmer for 2 hours, skimming as often as necessary. Add all of the remaining ingredients. Continue to simmer, skimming the surface as necessary, until the broth is fully flavored, about 1 hour. Remove the chicken pieces from the pot and cool slightly. Dice or shred the meat and use to garnish the broth or save for another use; discard the skin and bones. Strain the broth through a colander or sieve into a large metal container. Discard the solids. If you are using the broth right away, skim off any fat on the surface. If you are not using the broth right away, cool it quickly by transferring it to a metal container (if it’s not in one already) and placing the container in a sink filled with ice cold water. Stir the broth as it cools, and then transfer it to storage containers. Store in the refrigerator for up to 5 days, or in the freezer for up to 3 months. Label and date the containers clearly before putting them into the freezer. Make It Easier: Some stores sell packages of necks and backs that can be used to prepare broth. This broth can also be made with the carcasses of roasted birds. Save the bones after all of the meat has been pulled or carved away (freeze them if you will not be making the broth within a day or two). You will need the carcasses of about 3 birds for each batch of broth. Add the bacon to a casserole dish or pan and sauté until the bacon is crisped and browned, 5 minutes. Transfer the bacon to a bowl with a slotted spoon, letting the oil drain back into the casserole. Return the casserole to the heat and heat the oil until it shimmers. Season the beef generously with salt and pepper. Add the beef (working in batches to avoid crowding the pan) and sear on all sides until brown, about 8 minutes. 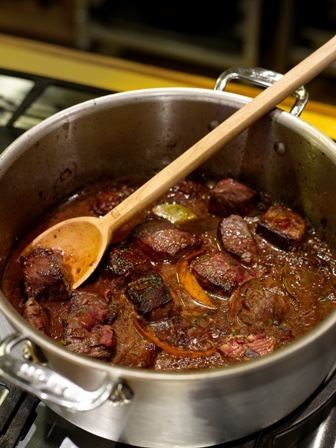 Transfer the beef to the bowl with the bacon using a slotted spoon and letting the oil drain back into the casserole. Add the onion and sauté, stirring occasionally, until deeply caramelized, 25 to 30 minutes. Return the beef and bacon to the casserole, add the red wine, orange peel, bay leaves, garlic, and parsley; bring the liquid to a boil. Immediately adjust the heat for a gentle simmer. Season the stew to taste with salt and pepper throughout cooking time. Simmer the stew, covered, until the beef is nearly tender, about 2 hours. Add the olives and continue to simmer until the beef is fork tender, 1 to 1 1/2 hours. Serve in heated bowls. LOVE the recipes. My favorite on your website! Always something really interesting and unique to try. THANKS! The Catalan Beef Stew look amazing, I will have to try that out.